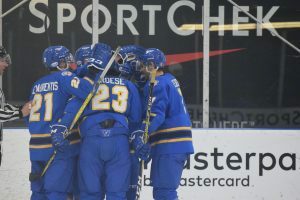 The Ryerson Rams men’s hockey team overcame a roller-coaster pre-season game against the McGill Varsity Reds on Saturday, taking the 4-3 win at the Mastercard Centre. The first period started slowly as both teams took about eight minutes to get their feet underneath them, but all that changed after an offsetting pair of roughing penalties were called following a post-whistle skirmish. The rough–and–tumble first period ended scoreless, with McGill on their second power play to start the second frame. McGill failed to tally a goal during their power play, but forward Jerome Verrier did open the scoring after a mistake on the blue line during a Ryerson power play. The unassisted short–handed goal for McGill was a backhander on a breakaway, putting the visitors up 1-0. The lead did not last long though as captain and blueliner Alex Basso slapped a knuckling puck past McGill goalkeeper Joe Fleschler in transition, knotting the game up at one goal apiece. Assists on the play went to defensive partner Alex Leader and freshman goalie Mario Culina. The third period was dominated by the Rams, particularly the line of Vince Figliomeni alongside a pair of freshman, Steven Harland and David Miller. The line was unstoppable in the final 20 minutes of the game, combining for six points on the night. Harland had two assists, the first coming after shooting a puck on net following a pass by Miller, with the resulting rebound being knocked in by Figliomeni. The second goal was scored by Miller after a gorgeous pass from Harland, putting the Rams up 3-1. Keanu Yamamoto, brother of Kailer Yamamoto, the Edmonton Oilers 2017 first round pick, deposited a goal with less than two minutes left in the game for the Reds to cut the lead to 3-2. The Reds pulled their goalie in an attempt to get an extra goal, but Ryerson’s Aaron Armstrong put the nail in the coffin with an empty-net goal, or so it seemed. A late goal by McGill with 14 seconds left on the clock had Ryerson holding its breath, as it was again just a one–goal game. Despite the amount of time left, McGill made one final push to tie the game. With three seconds left on the clock, the Reds had a great chance to tie in front of goal, but Culina was up to the task. Ryerson held on to win by a final score of 4-3. The Rams look to remain undefeated when they face off against OUA rivals York Lions this Tuesday night.